Want to be notified of new releases in KaimingHe/deep-residual-networks? By Kaiming He, Xiangyu Zhang, Shaoqing Ren, Jian Sun. 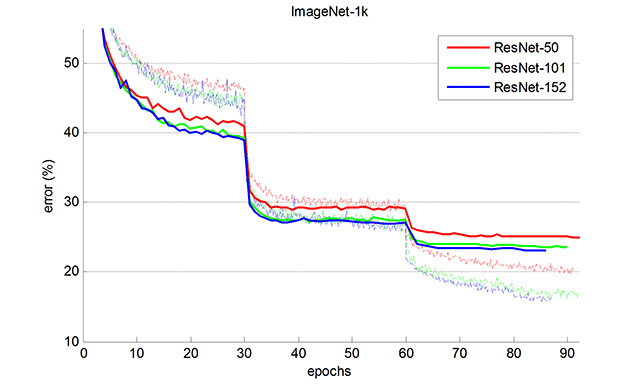 This repository contains the original models (ResNet-50, ResNet-101, and ResNet-152) described in the paper "Deep Residual Learning for Image Recognition" (http://arxiv.org/abs/1512.03385). These models are those used in [ILSVRC] (http://image-net.org/challenges/LSVRC/2015/) and COCO 2015 competitions, which won the 1st places in: ImageNet classification, ImageNet detection, ImageNet localization, COCO detection, and COCO segmentation. These models are converted from our own implementation to a recent version of Caffe (2016/2/3, b590f1d). The numerical results using this code are as in the tables below. These models are for the usage of testing or fine-tuning. These models were not trained using this version of Caffe. GPU memory might be insufficient for extremely deep models. Changes of mini-batch size should impact accuracy (we use a mini-batch of 256 images on 8 GPUs, that is, 32 images per GPU). Implementation of data augmentation might be different (see our paper about the data augmentation we used). We randomly shuffle data at the beginning of every epoch. There might be some other untested issues. In our BN layers, the provided mean and variance are strictly computed using average (not moving average) on a sufficiently large training batch after the training procedure. The numerical results are very stable (variation of val error < 0.1%). Using moving average might lead to different results. In the BN paper, the BN layer learns gamma/beta. To implement BN in this version of Caffe, we use its provided "batch_norm_layer" (which has no gamma/beta learned) followed by "scale_layer" (which learns gamma/beta). We use Caffe's implementation of SGD with momentum: v := momentum*v + lr*g. If you want to port these models to other libraries (e.g., Torch, CNTK), please pay careful attention to the possibly different implementation of SGD with momentum: v := momentum*v + (1-momentum)*lr*g, which changes the effective learning rates.